As we pointed out in a previous post, the 2013 North Carolina Housing Finance Agency (NCHFA) Qualified Allocation Plan (QAP) includes a requirement that all 9% tax credit deals include at least one principal who has successfully developed, operated and maintained at least one 9% tax credit project in the state of North Carolina. Such projects must have been placed in service between December 1, 2006 and January 1, 2012. It is important to note that the sponsors listed may have actually partnered with other entities on these projects. Feel free to contact me (Jeff Carroll) at 704-905-2276 with any questions you may have regarding your project. The 2013 North Carolina Housing Finance Agency (NCHFA) Qualified Allocation Plan (QAP) includes a requirement that all 9% tax credit deals include at least one principal who has successfully developed, operated and maintained at least one 9% tax credit project in the state of North Carolina (see Section IV(D)(1) of the 2013 QAP). All such projects must have been placed in service between December 1, 2006 and January 1, 2012. The experienced principal must be identified as the Applicant in the preliminary application. In addition, the principal must be either the general partner or the managing member of the ownership entity and remain responsible for overseeing the operation of the project for at least two years after it is placed in service. Five (5) application points will be awarded if the Applicant’s principal office is in North Carolina. 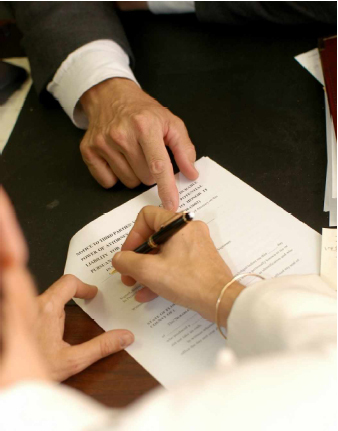 The Agency reserves the right to determine whether a principal is, in fact, experienced as required by the QAP. One of the most closely followed parameters in tax credit development is equity pricing. 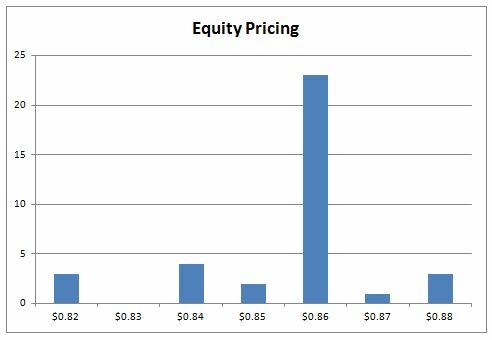 Although sometimes quoted as percent yield, equity pricing is usually expressed as the ratio of equity raised per dollar of tax credit over the 10-year compliance period for a project ($ Equity / $ Annual Tax Credit x 10). 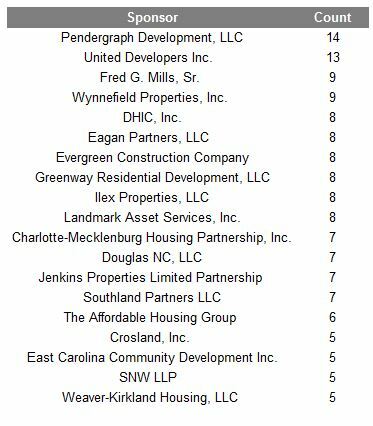 In the table below we present equity pricing for North Carolina projects awarded credits in 2012. For projects that received awards in 2012, the average equity pricing was $0.86. Age restricted (elderly) projects averaged $0.86, while general occupancy (family) came in at $0.86. New construction deals averaged $0.86, while rehabilitation deals came in at $0.85. There were no adaptive reuse projects in North Carolina’s 2012 allocation. The graph below shows the distribution of awards. The overwhelming majority of projects were priced at $0.86. A handful were priced as high as $0.88 with several coming in between $0.82 and $0.85. Allen & Associates Consulting, Inc. specializes in development consulting for affordable housing. Feel free to contact me (Jeff Carroll) at 704-905-2276 with any questions you may have regarding your project. 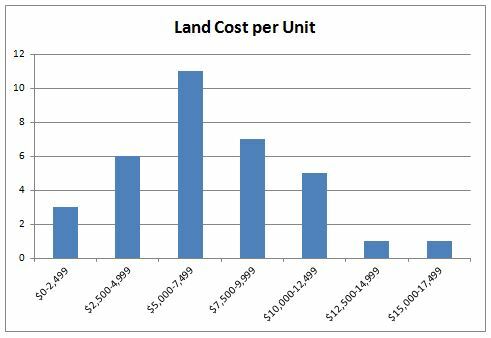 The next parameter we will consider is land cost per unit. All things being equal, projects with lower land costs per unit will be easier to finance. In the table below we present land cost per unit for projects awarded credits in 2012. For projects that received awards in 2012, the average land cost was $6,868 per unit. Age restricted (elderly) projects averaged $6,506 per unit, while general occupancy (family) came in at $7,049. New construction deals averaged $6,592 per unit, while the allocated land portion of total purchase price for rehabilitation deals came in at $8,011 per unit. There were no adaptive reuse projects in North Carolina’s 2012 allocation. 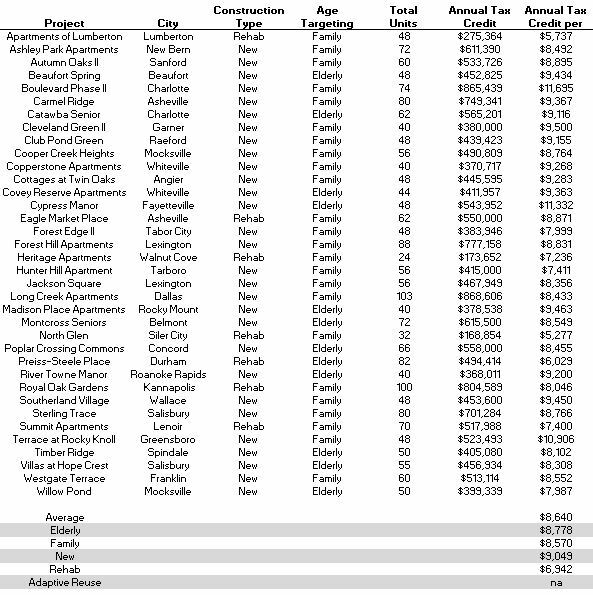 The majority of projects were clustered between $5,000 and $10,000 per unit. Several exceeded this amount; several were lower than this amount. A few had virtually no basis in the land whatsoever (the land was contributed). 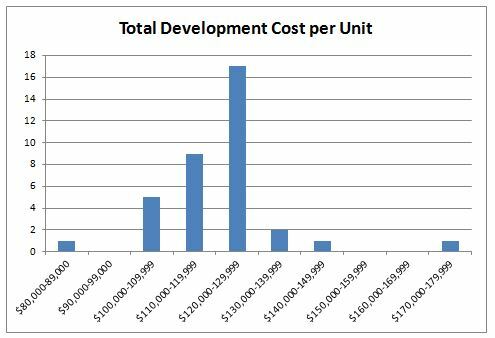 Another important parameter for developers to consider is development cost per unit. 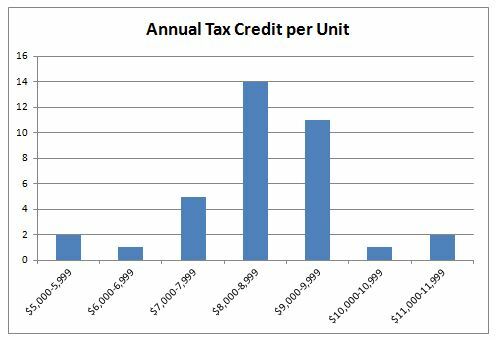 All things being equal, projects with lower development costs per unit will require less tax credit. 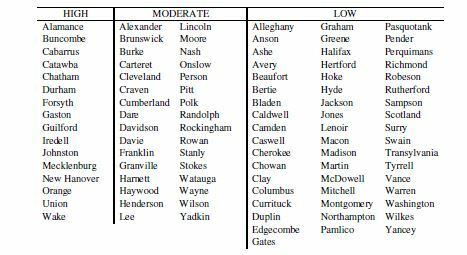 And as we saw in a previous post, tax credit per unit is an important tiebreaker criteria employed by the North Carolina Housing Finance Agency. In the table below we present development cost per unit for projects awarded credits in 2012. For projects that received awards in 2012, the average development cost was $121,667 per unit. 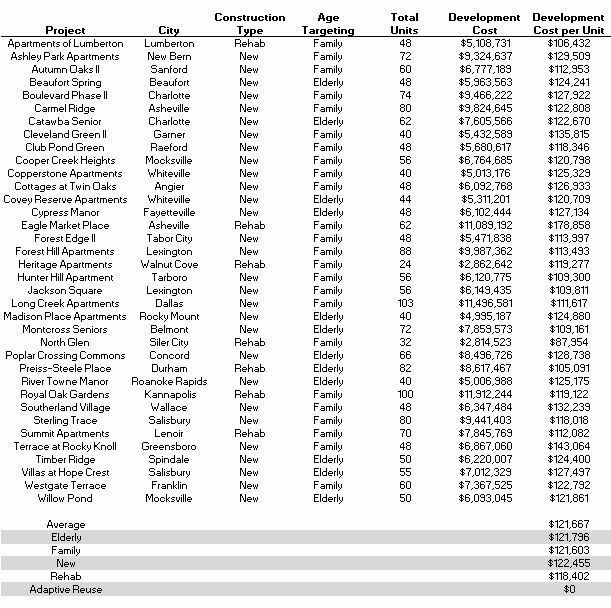 Age restricted (elderly) projects averaged $121,796 per unit, while general occupancy (family) came in at $121,603. New construction deals averaged $122,455 per unit, while rehabilitation came in at $118,402. There were no adaptive reuse projects in North Carolina’s 2012 allocation. 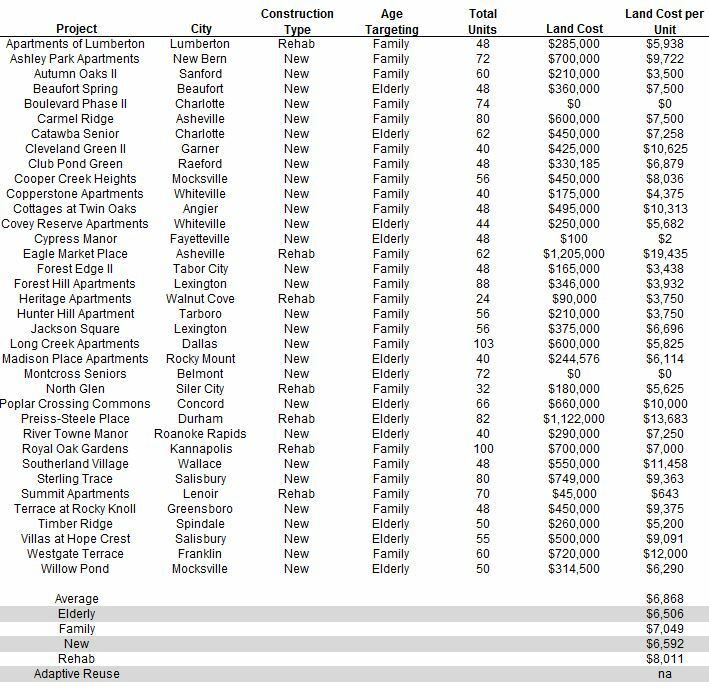 The majority of projects were clustered between $110,000 and $130,000 per unit. Only a few exceeded this amount; a handful came in between $100,000 and $110,000. In order to be competitive, sponsors should attempt to keep their development costs below $130,000 per unit. Allen & Associates Consulting, Inc. specializes in development consulting. Feel free to contact me (Jeff Carroll) at 704-905-2276 with any questions you may have regarding your project. The 9% tax credit application process is very competitive. Every point counts. Every dollar counts. That’s why seasoned developers look closely at parameters such as land cost per unit, total development cost per unit, annual tax credit per unit, tax credit equity per unit, and tax credit pricing ($ equity / $ tax credit) when putting together their proposals. In North Carolina the #1 tiebreaker criteria is tax credit per unit. Projects with the least amount of federal credit per unit are given priority over competing projects, all other things being equal. 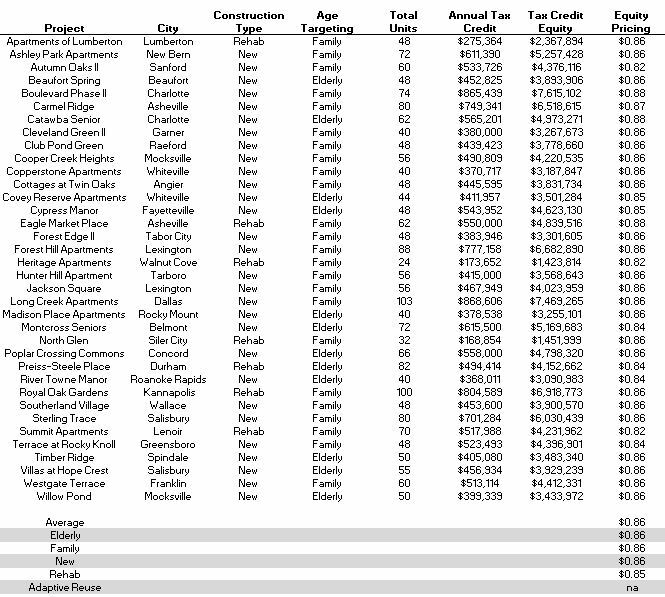 In the table below we give the annual tax credit per unit for projects awarded credits in 2012. For the North Carolina projects that received awards in 2012, the average annual tax credit was $8,640 per unit. Age restricted (elderly) projects averaged $8,778 per unit, while general occupancy (family) came in at $8,570. New construction deals averaged $9,049 per unit, while rehabilitation came in at $6,942. There were no adaptive reuse projects in North Carolina’s 2012 allocation. The majority of awarded projects were clustered between $8,000-10,000 per unit. Only a few projects exceeded this amount. In order to be competitive, developers should attempt to keep their projects below $10,000 per unit in annual tax credits. Allen & Associates Consulting, Inc. specializes in development consulting. Feel free to contact me (Jeff Carroll) at 704-905-2276 with any questions you may have regarding your tax credit development. North Carolina Housing Finance Agency’s Rental Production Program (RPP) makes loan funds available for qualifying affordable housing projects in the state. RPP funds come from a variety of state and federal programs: HOME funds (federal), HOME Match funds (state), North Carolina Housing Trust Funds (state). At least 40% of the qualified units must be income restricted to at most 50% of AMI. RPP loans will have a 20-year term and a maximum interest rate of 2%. NCHFA may reduce the interest rate to ensure project feasibility at its discretion. Rural Development properties will be underwritten at the Rural Development-approved interest rates. Projects will be underwritten assuming a 7% vacancy rate. USDA-RD 515 properties will be underwritten at the Rural Development-approved vacancy rates. Projects requesting RPP funds will be underwritten assuming that rents will escalate at 2% per year and operating expenses will escalate at 3%. Replacement reserves will be trended at 4% however. Projects with HOME funds will be underwritten assuming that rents will escalate at 1.50% per year. New construction projects must budget a minimum of $3200 per unit per year in operating expenses (not including taxes, replacement reserves or resident support services). Rehabilitation and adaptive reuse projects must budget a minimum of $3400 per unit. New construction projects must budget $250 per unit in replacement reserves. Rehabilitation and adaptive reuse projects must budget a minimum of $350 per unit. RPP loans are cash flow loans. 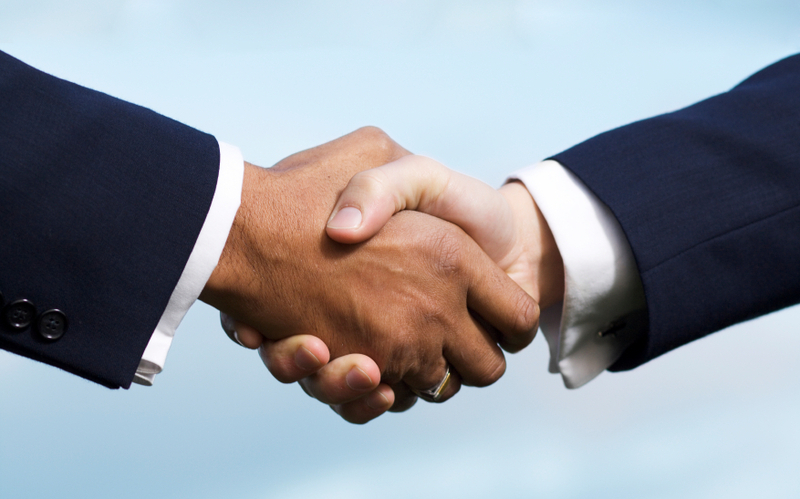 All projects must demonstrate an ability to repay at least a portion of the RPP loan. NCHFA will establish loan payments so that the project will maintain a debt coverage ratio (DCR) of 1.15. This may result in a large balloon payment due at maturity. RPP loan funds sometimes require Davis-Bacon wages. Also, use of the funds sometimes reduces the qualified basis for tax credit projects. Developers should carefully weigh these facts when considering RPP funding. Feel free to contact me (Jeff Carroll) at 704-905-2276 with any questions you may have regarding your tax credit development. If the project is in a High Income county: (a) 25% of the units must be affordable to households with incomes at or below 30% of Area Median Income (AMI), or (b) 50% of the units must be affordable to households with incomes at or below 40% of AMI. If the project is in a Moderate Income county: 50% of the units must be affordable to households with incomes at or below 50% of AMI. If the project is in a Low Income county: 40% of the units must be affordable to households with incomes at or below 50% of AMI. Feel free to contact me (Jeff Carroll) at 704-905-2276 with any questions you may have regarding your tax credit financed property. Developers often ask whether it is possible to group these units into the lowest-rent unit type (1-bedroom versus 2- and 3-bedroom units). State housing finance agencies normally prefer to see the lower-income units distributed proportionally between unit types.